Brit rock cheeky chappies Reef loved their recent run of reunion dates so much that they're sticking around for another batch later this year. For more information visit www.reefband.com. 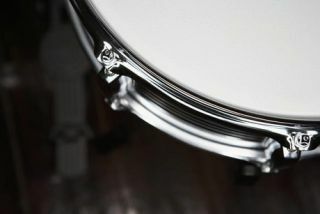 DW has unveiled its latest additions to the snare market, which they think will solve the age-old price vs quality problem for many drummers out there. The all-maple PDP Blackout series features a rather fetching high-gloss black finish, side-to-side throw off and Remo heads. Jim DeStefano suggested the changing music market played a hand in the line's creation. He said: "It's obvious that drummers are seeing better values than ever at their local drum shops. Long gone are the days when drum companies can down spec products and still get the sale because the price is right. The fact is that the market is flooded with really good sounding stuff for a fraction of the price of what drummers used to pay, even ten years ago. We think our Blackout snares are PDP's answer to today's expectations." For more details check out www.dwdrums.com. The great and the good of the drum world flocked to Germany last week for the first Sonor Days festival. A programme crammed full of awesome masterclasses and clinics saw the likes of Gavin Harrison and Benny Greb put in appearances for a 5,000-strong audience. Thomas Barth, Marketing and Artist Relations Manager for Sonor, was pleased that the months of planning and preparation paid off. He added: "The event exceeded our expectations and the team with 200 helping hands landed a masterstroke looking at the organisational side of the festival." You can get taster of the drumming delights Benny Greb laid on by checking out this clip from a recent performance by the session ace.